The first time Jason Richards crawled into a cave, he discovered a scatter of bison bones and a human skull. For a 14-year-old, that was all it took; he would spend the rest of his life exploring the underworld. The skull presaged what he would learn about caving: You can never predict what you’ll find. Slaughter Canyon is the most exotic and colorful cave I’ve ever been in, a grotesquerie of bizarre formations, most likely gnawed into their convoluted forms and surprisingly vivid colors by ancient sulfuric acid in suspension in the cave’s air. Most of the park’s 500,000 annual visitors never see Slaughter Canyon Cave because it’s a 30-minute drive from the visitor center and tours require reservations. But it’s even more spectacular than Carlsbad Cavern, the park’s famous centerpiece and namesake. The first recorded visitor to explore Carlsbad Cavern and come out to tell about it was Jim White, a cowboy who discovered the cavern entrance in 1898 after he noticed an odd stream of smoke on the horizon. Investigating, he discovered it was a cloud of bats boiling out of a cave. 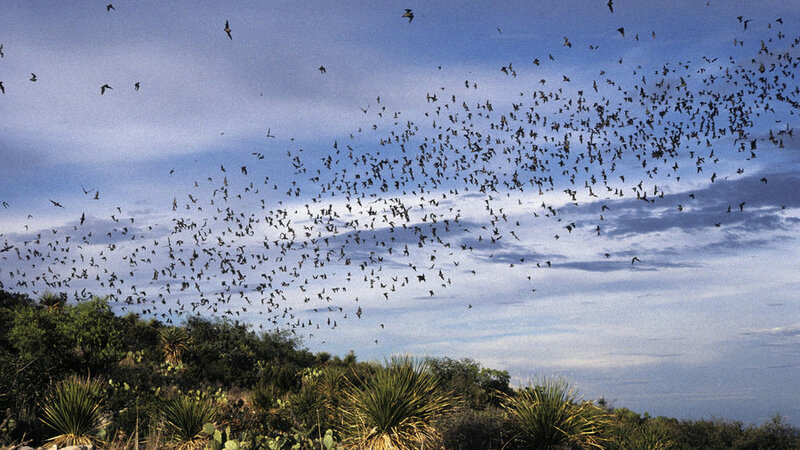 For the first 15 years, Carlsbad Cavern’s prime enterprise was mining―bat guano, for fertilizer―but eventually the potential for tourism dawned. The site became a national monument in 1923 and a national park seven years later. We humans, normally lovers of natural light and vivid color, are drawn into caves by a web of intersecting reasons. A cave is an alien world, an environment so unlike the Earth’s surface that it might as well be another planet. “It’s a poor man’s astronaut adventure,” says Mike Huber, a hard-core caver who moved to Carlsbad in 1990 for southeastern New Mexico’s constellation of otherworldly caverns. Richards cites the thrill of discovery―the not-too-remote possibility of being the first human ever to view something on our home planet. And there is the intangible security of entering a womblike space that evolves only on the geological clock. A cave eclipses the urgency of the morning’s news. Still, Richards has had unnerving experiences in caves. Nine years ago, during a week-long expedition into Lechuguilla Cave, the park’s largest known cavern, he awoke from a nightmare to see a soft yellowish glow outlining his body in the cave’s total darkness. For months he told no one, expecting that they would think he’d been hallucinating. Then he encountered two cave microbiologists who had had identical experiences in the same cave. One possible explanation: After days in total darkness, human eyes may “learn” to see infrared light. Visitors to Carlsbad Caverns generally have less spooky experiences, even though the park has greatly expanded the menu of cave tours in recent years. A thorough Carlsbad visit now can stretch across two or three days and 10 or more hours of underground exploration, most of it escorted by rangers. Only Carlsbad Cavern’s Big Room, which would swallow nine football fields, and the Natural Entrance remain open to self-guided exploring. The National Park Service studies completed in 1993 found that more than 16,000 formations had been stolen or vandalized, so rangers took control of the herds in all the delicate areas. Under a ranger’s watchful guidance, visitors can take walking tours of several branches of Carlsbad Cavern. The Hall of the White Giant tour is as close to enthusiast caving as most casual visitors ever get; tour groups are limited to eight, and there’s plenty of crawling and slippery passages. The Lower Cave tour requires a rope-assisted descent into chambers of ethereal Gothic architecture some 90 feet below the cavern’s Big Room. Slaughter Canyon Cave, discovered in 1937, is another cave system within the park; its entrance is a 23-mile drive west of the park’s visitor center. I ask whether vast Lechuguilla Cave, which was not thoroughly explored and mapped until 1986, will ever be opened to the public. It sounds irresistible―there are stories of selenite crystal sprays forming “chandeliers” hanging 20 feet down and helictites twisting like the tresses of Medusa. “Not a chance,” says Richards. Even the most cautious human intrusions alter a cave’s ecosystem by introducing organic matter such as sloughed-off skin cells and assorted microorganisms hitching rides. Some caves need to be preserved as pristinely as possible because you can never predict what you’ll find―or how you might accidentally destroy it. Lechuguilla’s natural beauty isn’t its most amazing quality, Richards says: The cave has yielded medicinal microorganisms that selectively attack cancer cells. Carlsbad Caverns National Park is 27 miles south of Carlsbad, New Mexico, on U.S. 62/180. The nearest major airport is El Paso, Texas, 150 miles west of the park. The park has a restaurant ($); Carlsbad has motels and restaurants. For a trip planner, contact the Carlsbad Chamber of Commerce (505/887-6516). The temperature within Carlsbad Cavern is 56° ; a light jacket and rubber-soled shoes are recommended for cave tours. Above- ground, dress for the high Chihuahuan Desert: June’s high averages 91°, with a low of 64°. Plan your visit by contacting the park (505/785-2232). Hall of the White Giant and Spider Cave tours run once weekly and may fill up two months in advance; Lower Cave tours run more frequently. Tour fees range from $7 to $20 plus $6 park entrance fee, and difficulty varies: Some excursions require gloves, kneepads, hard hats (provided), and lights (provided, but bring four AA batteries). Don’t miss Slaughter Canyon Cave (bring a flashlight), with two daily tours Memorial Day weekend through Labor Day. To make tour reservations, contact the National Park Service (800/967-2283).